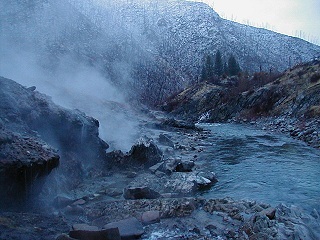 Kirkham Hot Springs, located near the official Boise National Forest campground of the same name, features somewhat shallow rock pools (unimproved) with sand/rock bottoms next to the river. The multiple hot waterfalls are quite the sight! 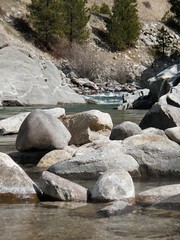 Both the pools and hot waterfalls can be seen from a large pullout off highway 21 on the west side of the campground. Be warned, this place is very popular during the summer and oftentimes winter season. Expect a full-house in the summer. Intrepid soak seekers can make online reservations right here. 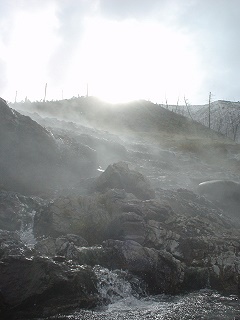 Kirkham additionally servs as an interpretive site for geothermal activity. 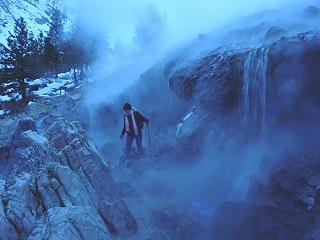 There is a trail that winds through the seeps and sources which continuously provide the hot springs pools with fresh mineral water. 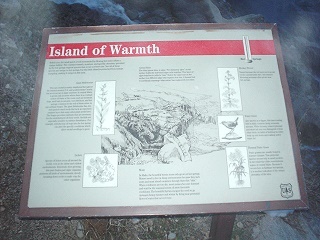 There are signs along the way that describe the hot springs and area history. Good luck with that! 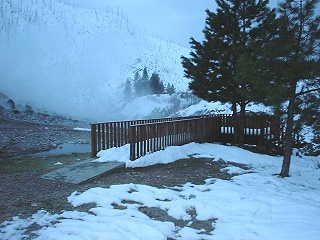 This is a well-known and attended family hot springs which are visible from a state highway. Kirkham is posted as requiring swimwear, which means the FS and campground host are on the lookout. 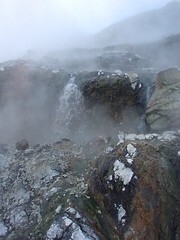 Hot springers commonly refer to places like Kirkham as textile soaks. Accessible year-round. Campground gated during winter months. Official CG open date is May 20th. The Banks-Lowman Highway and Highway 21 can be a nightmare during winter and spring storms and can close or make the road impassible due to giant rocks falling on the road (seriously!). ALWAYS check road reports prior to your departure. 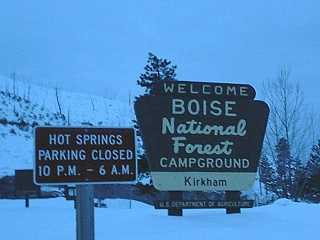 Kirkham is an actual Boise National Forest Campground, and the hot springs are just a few steps away. Other NF camping sites/areas are also available nearby off highway 21. Summers in this area can be hot, and you'll find no reprieve in the campground as there are no shaded sites. Kirkham Campground is located approximately 5 miles east of Lowman off Highway 21 near Mile Marker 77. Campground pit toilet is available during the warmer months. Lowman may or may not have a gas and go store available (they seem to come and go on a regular basis). Closest gas and food is available either in Garden Valley or Idaho City. Kirkham Campground is about 4.5 miles from Lowman along highway 21. Drive through the campground to find the small parking area and fee box. 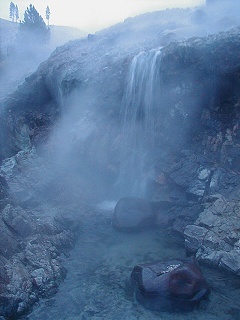 The hot springs are a short hike from the parking area. The campground and hot springs are well signed. 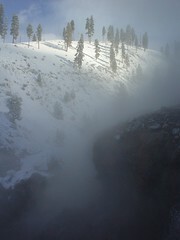 The brief hike down to the pools can be treacherous during inclement weather. Wear good shoes/boots and bring a hiking stick/trekking pole for balance. There is a $5 parking fee during the day and the hot springs have nighttime closure in effect from 10pm to 6am. What more can I say that hasn’t already been said about Kirkham Hot Springs? Which is excellent, in terms of textile soaking. When driving past the full pullout for Skinnydipper on the way in, I noticed that even the pullouts before and after were akin to overflow parking. Pine Flats and Hot Springs campground had a couple vehicles and sole campers each. Timing for Kirkham was just right, as four groups of people all left upon approach. Two other groups pulled-up and parked as my ride sped off down highway 21, long after a great soak was had. Minimal trash was a welcome surprise and all people encountered were of the friendly lot. There was about four pools prime for soaking. The largest pool had some nice depth to it as well. Watching the sun set and moon rise from the hot springs was the icing on the cake. Sadly, just like the rest of Idaho and the northwest, there was a severe lack of snow evident for this time of the year. It practically looked like September outside. Unless paramount snowfall occurs, this summer will see a multitude of wildfires. The gate to the campground was still closed despite the lack of snow. A walk through the campground and surrounding area revealed minimal trash, very nice. Usually, this time of year, it's bad news. I ran into a couple young ladies that were setting up camp for the night after hiking the interpretive trail. Best time of the year for that. No campground host + No other campers = No competition for the soak. For the first time ever, the soaking pool was actually too hot, clocking in at 111 degrees! It took less than a second for me to find the newly constructed lower pool, right next to the river's water line. As spring runoff kicks - this baby will submerge. The lower pool was awesome, clocking in at 108 degrees. The only drawback was the presence of a large number of medium sized gray spiders. These little buggars would actually dart across the water at top speed - straight at you! I had thought I avoided all of them until I put my sock on. One snuck in and bit the crap out of me... the first bite is still oozing blood, very swollen and it has been over 4 days since it occurred as I write this. One the way out I came across a fellow backpacking across America, except, he was hitchhiking as well. Maybe he needed a break, there was snow in the forecast that night and he was heading towards Stanley, Idaho - one of the coldest places in the word. Lots of trash in the campground area, someone crapped all over the public restrooms - literally! Light amounts of trash near the hot springs pools. The pool was in great shape, deepest yet! I watched a group of whitetail deer meander down to the river for a drink while I enjoyed a steamy soak. Good news all around. Low trash, great temperature and scenic views of a forest in the re-vegetative stage covered in snow. The roads were somewhat icy and the drive slow. Luckily there's plenty to look at. No new scalping updates, incidents (see 07.15.05 briefing) or other dark dealings to report at Kirkham... just excellent soaking (thank goodness)! The roads in were dry until reaching Lowman, with only light amounts of rock on the highway. However, the snow was beginning to come down, and I knew that the way out could get a little dangerous. A couple miles before the hot springs I came across a herd of elk - trapped on a section of the road with a steep drop-off on one side and vertical incline on the other. They were terrified; and slipped on the icy roads when trying to move too quickly. I followed the herd slowly until they reached a safe spot to get off the road. Please, give deer and elk a chance to get off the road before losing patience - causing them to panic and run excessively will deplete their energy beyond recovery. They have very little left to survive on until spring. 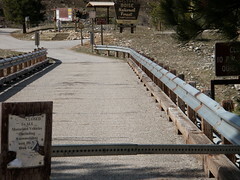 There was ample parking for 3-4 vehicles in Kirkham's pullout near the gated entrance to the campground, and a nice well-used path through the snow into campground and to the hot springs. It was slick heading down from the campground towards the river. 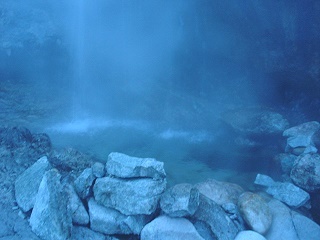 The jagged rocks have flat, smooth areas and are wet year-round; use a walking stick or trekking pole to ease your semi-steep decent to the hot springs. 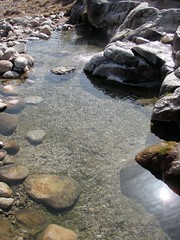 I was stoked to discover a new rock-walled pool built just below the first hot waterfall. It was fairly shallow and had room for about 4 people. 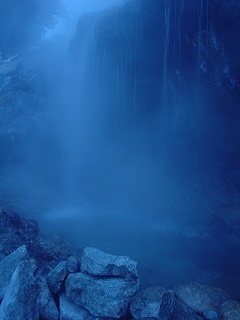 My favorite soak is located just around the corner, under the 2nd waterfall. This soak was bliss... a perfect 102º with plenty of room to stretch out. We soaked for a couple hours while watching the deer and elk graze on what little roots and foliage that could be found across the river. Just as we stirred to begin the dry-off, suit-up process a couple arrived to enjoy Kirkham. We politely greeted each other before hiking in the falling snow back to the pullout. The drive out was rough due to rapidly falling snow, but only for the first few miles. After the snow turned to rain it was smooth sailing. I'm not the biggest fan of roadside or 'practically' roadside soaks, but Kirkham was excellent. This is the rare time of year when you can steal a soak to yourself - if you dare to brave the roads! 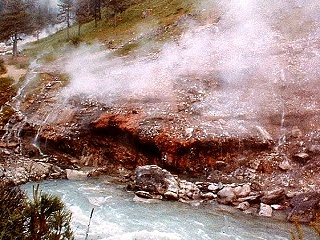 A lesbian-gang/clique related scalping took place at Kirkham Hot Springs near Lowman, Idaho on January 18th, 2005. This story made nationwide televised news in early February 2005 because of the urgent search for the scalping suspect. Follow up articles (non-televised) were released in February, March, April and finally July. The links to the articles and full story can be found on the here. What a great way to start Halloween! We arrived on the scene semi-early in the morning, there was a slight delay driving through the blizzard and fresh snow on highway 21 between Idaho City and Lowman. We were totally surprised to have this well-known soak to ourselves the whole time we were there. Excellent temps, low amounts of trash and hot hot hot water made this an excellent trip - especially soaking in the snow! Ahhhh.... nice and hot! This is the best time of the year to soak Kirkham because nobody is here! The pool was hot hot hot... we couldn't stand to submerge for too long before cooling off. No one else was around but evidence of moderate abuse was visible. Kirkham was great, with no one else at the pool early in the am. If you know Kirkham, then you know that this is a rare occasion. I didn't even find any trash to pick up... this made me quite happy as I have seen Kirkham trashed many times. The land near the springs is still scorched and black from a fire a couple years back. FYI, this little soaker (along with Pine Flats HS and Skinnydipper HS) is visited year-around by BSU students and other partiers from Boise and the Treasure Valley area mainly late at night. Well whadda you know... Kirkham was empty when cruising by in the afternoon! Except for the campground host. A rare sight anytime of the year when snow isn't on the ground. Giddyup! There was a traveling group of younger looking people inhabiting the campground, it looked like a mini tent-city. This in addition to a couple other vehicles full of day-soakers. Luckily, I qualified at Bonneville earlier - I just had to see what all the fuss was about at Kirkham. The was a single truck parked at Kirkham's gates although I didn't spot any soakers. Could be that the truck was broke down. I was shocked to see the entire campground vacant save for the hosts as we passed on by; it was soooo tempting to stop but it was quickly becoming dark and the hosts enforce nighttime closure. The campground entrance was gated with only one blue jeep cherokee parked in front around 11:00am. Quite a few people were enjoying Kirkham on this day. Just a few soakers here today. We tried for a late night stop @ Kirkham but were greeted by a sign posting "Nighttime Closure". 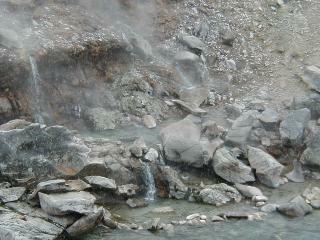 These hot springs are now closed from 10pm to 6am. We proceeded to the parking area because I wanted to take a couple pictures but quickly left as we spotted a parked patrol truck. No one was @ Kirkham CG or HS. There was about 3 RVs parked in the campground and the pools were actually vacant. When driving by there was so many people crowded around that Kirkham wasn't even visible... just a huge throng of humans.